6-foot Open Array Radar with 25 kW of Power. Pulse Expansion maximizes energy on target, increasing target size. 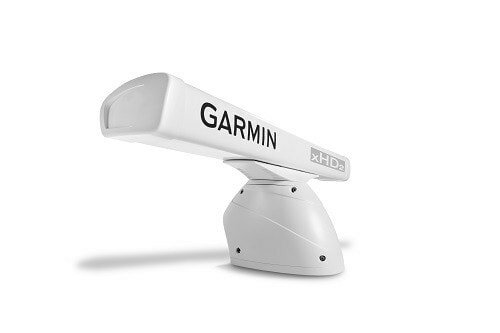 High-power xHD2 Radar with Narrow 1.1 Degree Beam: Our most powerful 6-foot high-definition radar with 25 kW of power, delivers excellent range, up to 96 nautical miles, even in fog or rain. Its narrow 1.1 degree horizontal beamwidth means it can pick out weaker targets further off in the distance than wider beamwidths. The result is this radar paints a clear, concise image of the shoreline, other vessels, and impending weather on your Garmin chartplotter. You get consistent target positions, excellent target separation and reliable operation. Its 8-bit true color imagery also helps you discriminate large targets from small ones and enhances target separation. Rotation speeds of 24 and 48 rpm with a max range scale of 96 nautical miles.